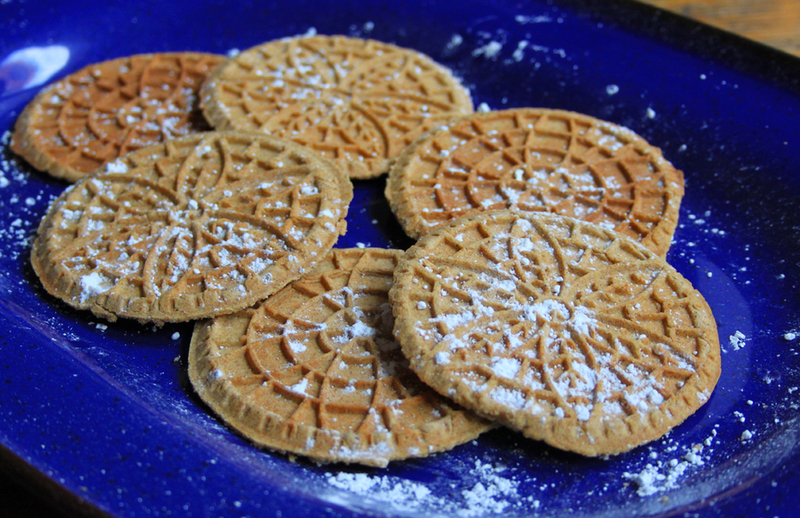 Pizzelles are a delicate round cookie that originated in Italy. My grandparents immigrated from Italy and brought the traditional pizzelle cookie with them. My mother has always had a pizzelle iron and has been making them since I was a kid, but they weren't always my favorite cookie as a child because they don't have a lot of sugar in them and are traditionally made with Anise. As an adult, I LOVE them. They are the perfect cookie to leisurely dunk in an after dinner coffee. This year I'm hosting Christmas at my home. As I was going over the cookie menu with my mom, I realized that I couldn't make pizzelles because I don't have an iron. Two days later a Cuisinart Pizzelle Iron showed up on my doorstep in an Amazon box. Mom's are so great, aren't they? I couldn't wait to crack that sucker open and get started on some imaginative pizzelle recipes. I made these whole wheat pizzelles for my daughter, and despite the healthy ingredients, they did turn out rather tasty. But I'm not going to stop with this first batch of pizzelles because I've got visions of pizzelles recipes dancing in my head. Roll them up and make cannolis? Ice cream cups? Orange cardamom pizzelles? The possibilities are endless! In a large mixing bowl, mix the eggs, sugar, butter and vanilla together. In a separate mixing bowl, whisk together the rest of the ingredients. Slowly add the dry ingredients to the wet ingredients mixing on low speed. Mix just until the ingredients are well combined. Measure a heaping tablespoon onto the iron and follow the iron's instructions for baking the cookies. Let fully cool on a hard surface or wire cooling rack before serving or storing.